The respect for human rights is one of the European Union's fundamental values. Any violation of these rights affects the democratic principles upon which our society is founded, whether they take place within or outside the EU. The European Parliament fights such violations through legislative action, including election observation, monthly human rights debates in Strasbourg and by enshrining human rights in its external trade agreements. Oleg Sentsov is a Ukrainian film director and writer, an outspoken opponent of Russia's annexation of Crimea. On 10 May 2014, he was arrested in Simferopol, Crimea, on charges of plotting acts of terrorism against the Russian 'de facto' rule in Crimea. Born in Simferopol, in 1976, Sentsov studied economics in Kyiv, followed by script writing and directing in Moscow. In 2012, he made his feature film debut, with the prizewinning film Gámer. In 2013, he became an active member of the AutoMaidan movement, which called for freedom, human rights and peace, and helped fuel the EuroMaidan Revolution. Later, during the illegal annexation of Crimea, in 2014, Sentsov organised humanitarian missions for Ukrainian soldiers, providing them with food, medication and assisting in the evacuation of their families. Due to his active role in the protests against the occupation, he postponed the production of his second feature film Rhino. In May 2014, Sentsov was arrested by the Russian security service (FSB), transported to Russia and put in front of a military court for alleged terrorist activity. He spent a year in detention prior to what Amnesty International described as "an extremely cynical show trial". Before he was brought before the court, the FSB publicly declared him guilty of terrorism, and Russian authorities unilaterally imposed Russian citizenship upon him, refusing Ukrainian officials access to him. However, Sentsov publicly denounced his Russian citizenship, stating that the only citizenship he possesses is Ukrainian. Sentsov was accused of leading a terrorist organisation preparing to blow up monuments in Crimea, however no conclusive evidence of his involvement in criminal activities was found. In addition, the prosecution's key witness publicly retracted his initial confession, acknowledging it was made under torture. Meanwhile, Sentsov has adamantly maintained he is innocent. Nonetheless, he was sentenced to 20 years in jail and sent to a high-security prison in Siberia, thousands of kilometres away from his home. 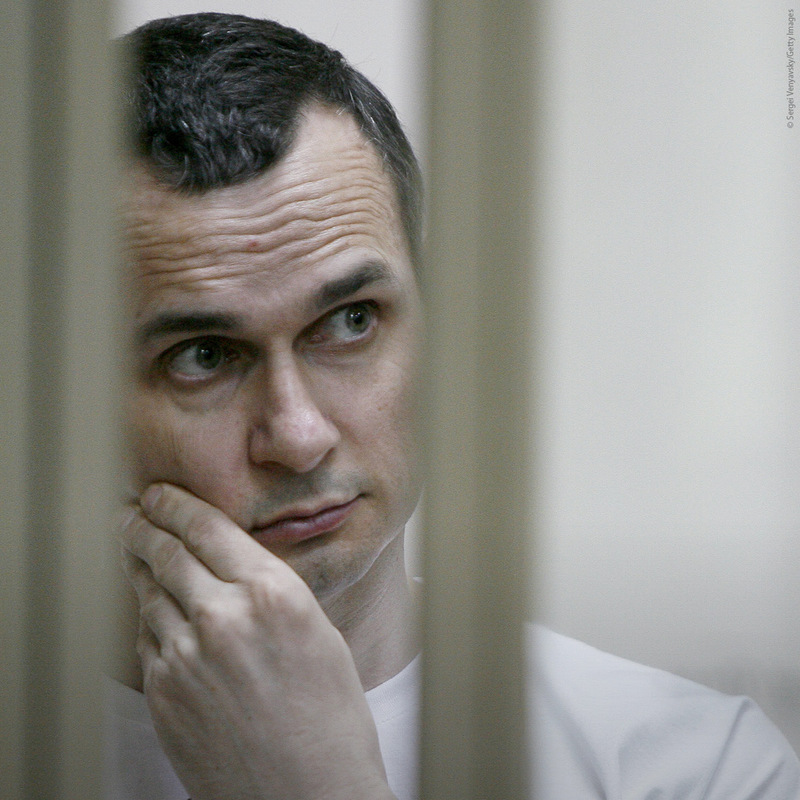 In his speech in court on the announcement of his verdict, Sentsov ridiculed the trumped-up process and expressed his hope that people in Russia will no longer be afraid. Sentsov embodies a spirit of resistance that has become an inspiration for people who face oppression. In May 2018, Sentsov went on a 145-day long hunger strike, asking for the release of all Ukrainian political prisoners in Russia. He was forced to end his hunger strike in October 2018, under the threat of force-feeding and due to the critical state of his health. Even in prison, Sentsov continues to fight for his convictions and for the freedom of his people. On 14 June 2018, the European Parliament adopted a resolution insisting on the immediate and unconditional release of Oleg Sentsov and all other illegally detained Ukrainian citizens in Russia. The former Sakharov Prize laureate, The Russian Human Rights Centre 'Memorial', has recognised Sentsov as a political prisoner. Many human rights groups and personalities have called for his release. World film celebrities and Russian filmmakers have also appealed to Russian President Vladimir Putin on this matter. For now, the calls to free Oleg Sentsov have not been heeded. How does the European Parliament support human rights? In addition to the Sakharov Prize, the European Parliament also supports human rights through concrete political and legislative action.